My girlfriends and I decided to throw a little last-minute tea party over the weekend, and I thought you'd enjoy seeing the photo, above. I'm the gal sitting next to the vase of flowers at far right. Well, OK, not really. 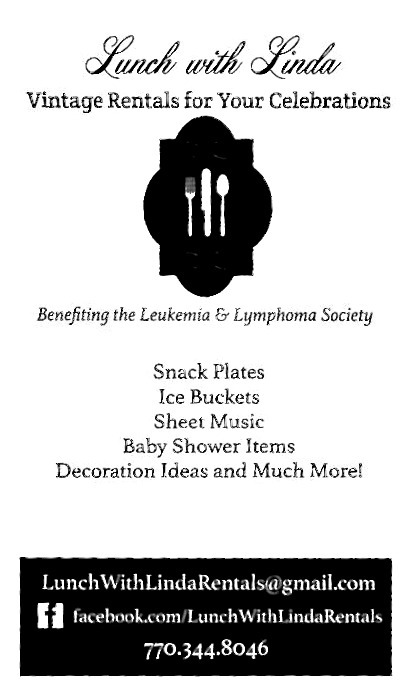 But wouldn't you love to have been part of such an elegant affair as this tea party of yesteryear? This is just one of many digital images you can find on the website of the Library of Congress, which says it "offers broad public access to these materials as a contribution to education and scholarship." You can read the legal stuff to see which photos are available and which are not, but all the ones I'm showing here are downloadable with no known restrictions on publication. 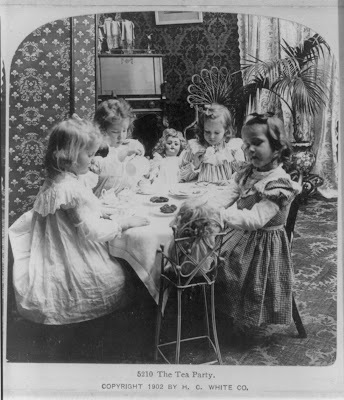 So what would one do with such images, like this one of some cute little girls having a tea party? Well, I can think of several ideas. 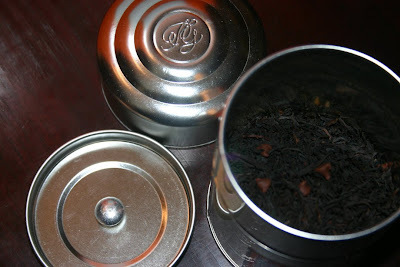 1) My fellow tea bloggers might use a photo that illustrates a post on their blog! 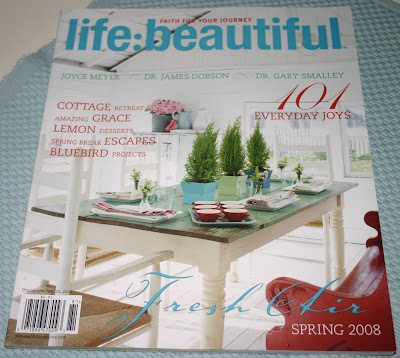 2) I can see these images being used for tea party invitations, scrapbooking, decoupage, collage, altered art, jewelry making (think soldered photo charms) and many other projects. 3) Tea educators and researchers might find some images they wish to use in their programs and materials. 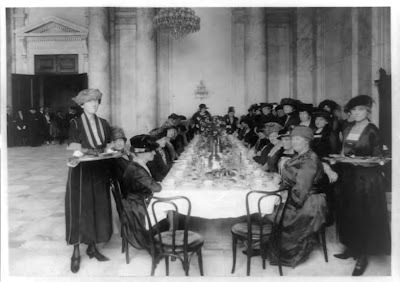 This photo of a Senate Ladies' Tea is one I find quite amusing, since some of the ladies look a little too serious. And perhaps my favorite of all is this photo of Mrs. George Pullman. I fairly swooned when I saw this photo, loving everything from her beautiful gown to the lovely tea service and the elegant lace tablecloth (double-click the photo to see the details better). I found these and many other great images using such search terms as tea, afternoon tea, tea party, teacup, teapot, tea set, tea service and tea leaf. And I'm sure I've merely scratched the surface of the treasures awaiting at this valuable web site. Just when you think the whole tea-as-cosmetic-ingredient thing has peaked, here comes another new product. Dove, for instance, keeps rolling out new additions to its Green Tea and Cucumber scented line. I saw coupons for shampoo, conditioner and deodorant (!) the other day, although I haven't tried these yet. If you have, please speak up! Two new products I have tried? First, a grocery store find: this new liquid hand soap from Dial that contains White Tea and Vitamin E pearls. I love trying new hand soaps around the house. These are what marketers call "cheap luxuries," and this new one has a very pleasant fresh floral fragrance. And You're Invited, the new stationery shop on Main Street in Senoia, has a nice selection of bath and body products from Time and Again. 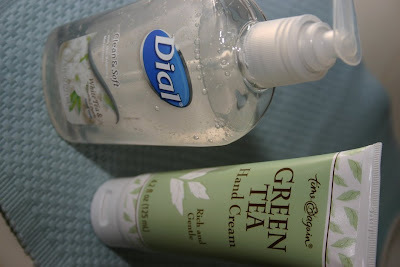 I tried this Green Tea Hand Cream and like it a lot. It's another light floral fragrance, it's even got tea leaves in the graphics, and now I'm eager to go back and try some of the other products in this line. One afternoon last week, the receptionist buzzed me to say I had a package downstairs. I wasn't expecting anything, but occasionally publishers send books for possible review, so I figured that's what this might be. This package, however, was a box much too large for a book, so I headed upstairs trying to guess what was inside. 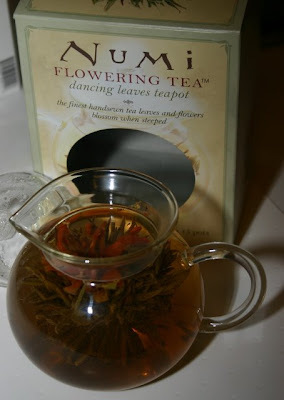 To my great surprise, a friend had quite unexpectedly sent me a thank-you gift for giving her a job lead, and it was the Numi Dancing Leaves Teapot and five flowering teas. Although I often splurge on teacups, I don't often treat myself to a new teapot, and this is one of the sweetest, cutest glass teapots I've ever seen. It is just perfect for brewing two cups of tea. (I'm calling it "The Brenda" in honor of my friend.) The great thing about display teas is that you can get two or three steepings from the same pot. The names of the tea bundles alone are just delightful: Flower Jewel, Starlight Rose, Dragon Lily, Emerald Sun and Golden Jasmine. 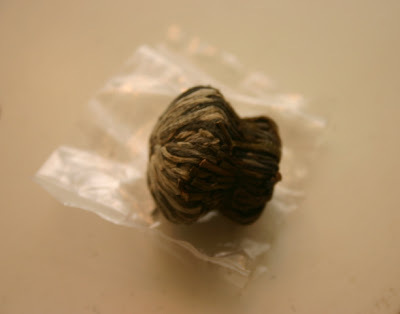 Isn't it just amazing that Chinese artisans handsew these tea leaves into compact little bundles that somehow know to blossom into gorgeous teas? 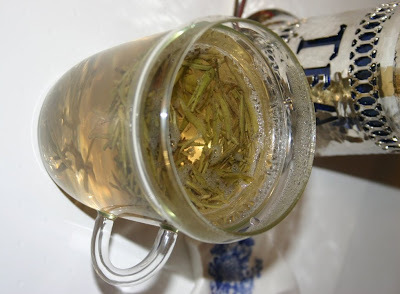 I made the Dragon Lily white tea first, and it was just delicious. I'll try them all eventually, but for now I'm just enjoying using this very thoughtful gift from a friend. Have you all tried display teas? And if so, what did you think of them? 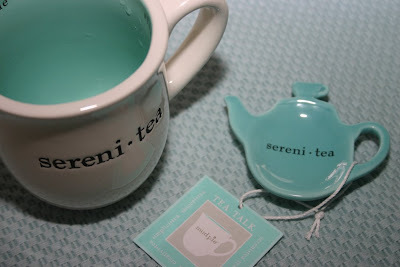 Last summer, I bought as my Seaside souvenir this "Sereni*tea" mug. 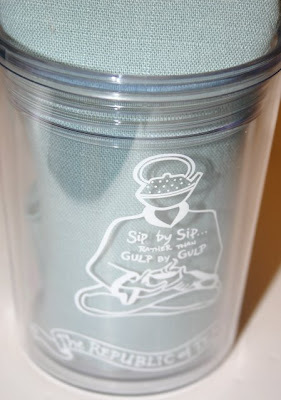 When I visited the newly-opened "You're Invited" stationery store in Senoia recently, I found the matching teabag rest. I don't know that I've seen one before with a teacup on top, so I'm especially fond of this piece. Obviously, I was charmed by the clever word, but this line from Mudpie also includes these variations: Prosperi*tea, Simplici*tea, Sinceri*tea, Creativi*tea and Tranquili*tea. Of course Mudpie wasn't the first to employ this use of "tea" as part of another word. One of this blog's treasured readers goes by the name ParTea Lady, and one of the tea blogs I've been reading the longest is The ParTea Planner. Here are a few more words that might find their way into our tea lexicon someday: Individuali*tea, Originali*tea, Reali*tea, Hospitali*tea (this could be a tea to welcome a new neighbor to town). And on a totally warped note, here are some tea party ideas using more of these words: Abnormali*tea: A tea for all your flaky friends. (C'mon. We've all got 'em!) Formali*tea: A black tie tea where everyone has to dress up and use courtesy titles: "Good afternoon, Mrs. McRae." "I welcome you to my home, Mrs. Smith." Punctuali*tea: A tea that starts at 2 p.m. on the dot. Not a minute sooner, not a minute later. Speciali*tea: The ear/nose/throat doctor has tea with the gastroenterologist. And a Hilari*tea, of course, would be the laughter-filled tea shared with your most humorous friends. Anyone want to add to the list? Lately, my leisure reading has included some novels with heavy-duty moral themes and dilemmas, and I wanted a break from that. 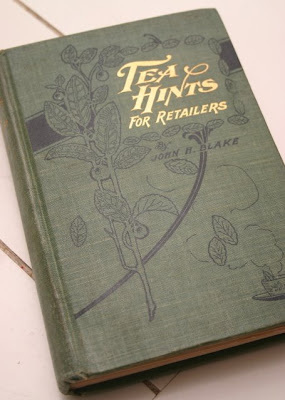 So I turned to a book from 1903, "Tea Hints for Retailers" by John H. Blake, who at the time of writing had some 20-plus years in the wholesale tea business. 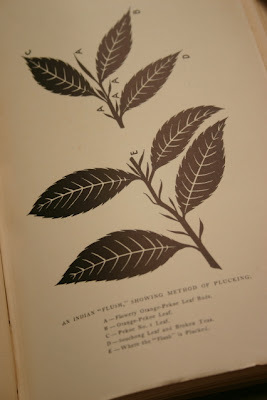 "Although tea is one of the most important items in the retail grocer's stock," he says, "and one of the few articles remaining to him upon which a really good profit may be made, it is, nevertheless, unfortunately true that few grocers can claim to have a comprehensive knowledge of the flavory leaf ..."
Blake aims to remedy that, and so far I'm learning a lot about tea as it was being promoted 105 years ago. The quaint writing style entertains as it informs, and I loved going through all the line drawings in the book, like this one. 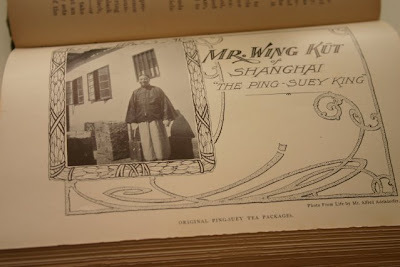 There are two dozen illustrations in the book, including this one of an original Ping-Suey Tea Package. The photo credit reads, "Photo From Life by Mr. Alfred Adelsdorfer." 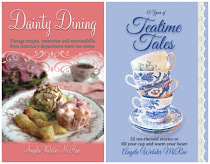 Fun reading for a tea lover! The bad news is, I waited 'til the last minute to go in search of the single Cadbury's creme egg I intended to eat this Easter, and alas, they were all sold out. 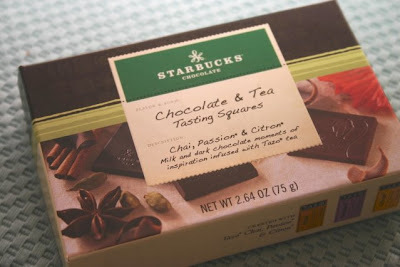 The good news is, as my consolation prize, I found this set of Starbucks Chocolate & Tea Tasting Squares at the grocery store. 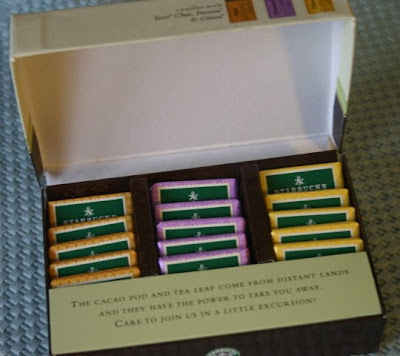 This box contains 15 squares of tea-infused chocolate, five each of three popular Tazo Tea flavors: Chai, Passion and Citron. I opted to first try one of each with a cup of English Afternoon Tea. Unwrapping the Citron Dark Chocolate first, I was struck by a strong lemon scent even before first bite. I haven't had that particular blend of Tazo Tea, but I'll bet I know what it tastes like now. Passion Tea, which I have tried before, is a bit strong, a little woo-hoo for my tastebuds, so I didn't imagine I'd like the Passion Dark Chocolate that well. It was my favorite! Sipping tea in between bites, I could definitely detect the berry notes in the chocolate each time I bit into it. And I saved what I suspected would be the most intensely flavored piece, Chai Milk Chocolate, for last. That was a good move. It tastes exactly like the Chai tea, and all those complex flavors seem present in the chocolate. And delicious as it all was, what does it say about me that I'd still rather have had that Cadbury egg! Yesterday I had the thought: I've got a new Easter outfit for me, so why not a new Easter outfit for the house? All I had in mind was, loosely, a feather and nest theme. I had this neat feather my husband found while mowing the lawn, and I thought perhaps I could frame it and surround it with nests. Well, the feather idea didn't work out, so I decided to stick with only the nests. And it's Suzanne's fault. Over at her gorgeous Pink Roses blog, a small miracle happened a couple of weeks ago: I won her springtime nest giveaway! 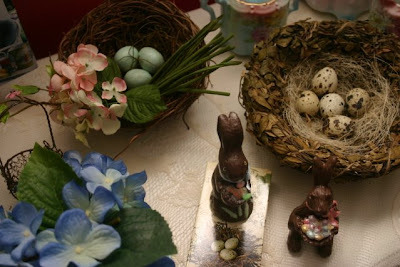 The vintage-looking, pink-flowered nest with the robin's egg blue eggs is the one she so thoughtfully gave away. The one at right came from a great little gift shop/home decor store in Senoia called -- get this -- The Best Nest! 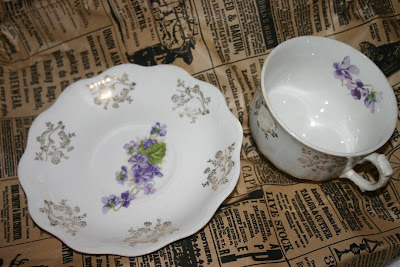 No matter what and where I'm decorating, teacups are always put to use. 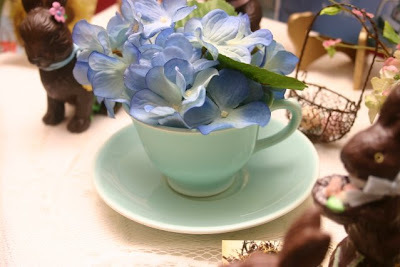 This blue LuRay set is a fine spot to park a silk hydrangea that was on a gift from a friend. I also decided it was time to fetch this pastel blue tea set, a long ago gift from my parents, out of the cabinet where it's been hibernating all winter. (I know, I know, it clashes with the red walls. They'll be blue soon. My DH - who has a birthday today, by the way! - says so.) 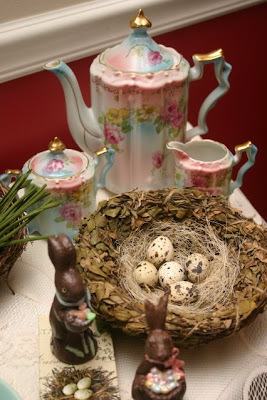 This set seemed to go well with the faux chocolate bunnies and nests. 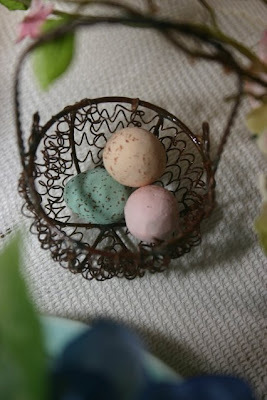 Speaking of bunnies and nests ... during my whirlwind shopping trip last week, I also stopped in Sharpsburg at Legacy Too, a beautiful, peaceful gift shop where I found this teeny little wire nest basket. Yes, it may be a tight economy, but $2 treasures like this make it bearable, don't you think? 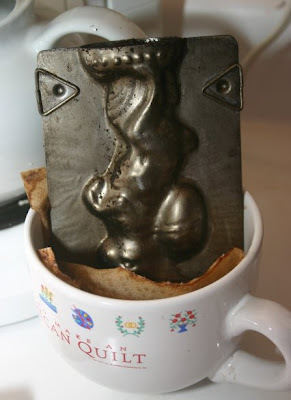 And I'm almost afraid to show you this, but ... Legacy Too also had this great reproduction chocolate mold, which is lovely but not food-safe, so you know what I'm molding right now? Tea grounds! I have no idea if this will work or not, but I've packed the mold full of tea-gone-flat from some teabags I saved for tea dying purposes. I've got it stuffed and standing in a paper towel in an oversized teacup, waiting on it to soak up water and moisten the tea. I wonder if there's a chance this will moisten up and then dry out by Easter? 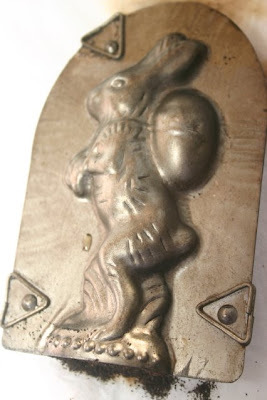 Oh well, even if it doesn't work, I'm happy to have the reproduction chocolate mold bunny. And I've prattled on quite enough for today, so I'll share more Spring decorating photos another day. Have A Blessed Easter, everyone! It's the first day of Spring, and like many of you I'll be moseying on over to the ParTea Planner blog today to see how other tea lovers are celebrating the arrival of this loveliest of seasons. 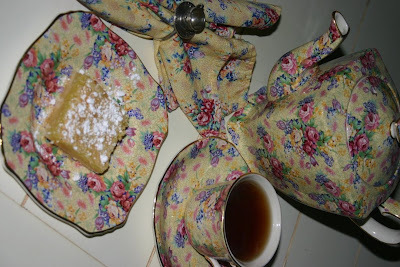 I decided to celebrate by pulling out my Royal Winton Welbeck chintz, my most favorite tea set. 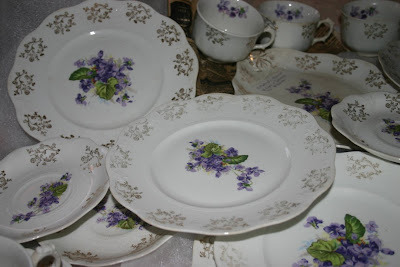 Did any of you, like me, get on the chintz bandwagon back when Victoria magazine was promoting this pattern? I'll have to tell you about that adventure someday! 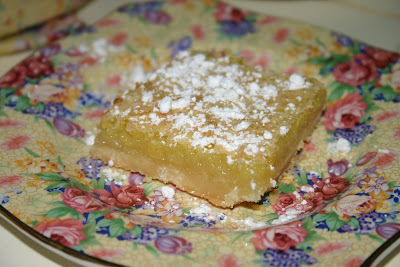 Yesterday was our annual Easter luncheon at work, and I made Lemon Bars. Sunny yellow lemons, sunny yellow teawares ... I rather think that yellow could well be named the official color of Spring! 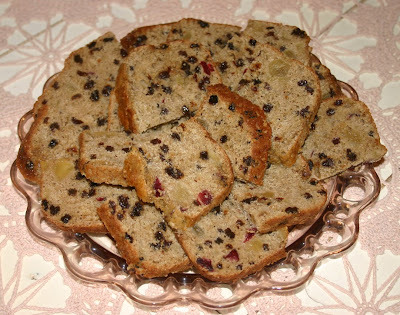 Last week, I was re-reading the March 1998 issue of Victoria magazine and came across a recipe for an Earl Grey-infused tea bread. I changed the recipe so much that it's easier for me to just share with you here how I did it, although if you want to make it like the original, see page 106 in that issue of the magazine. I'll print the recipe at the end, but first I wanted to show you the colorful jewel-toned dried fruit as it was soaking up the Earl Grey tea, which I had cold-brewed in the fridge overnight. 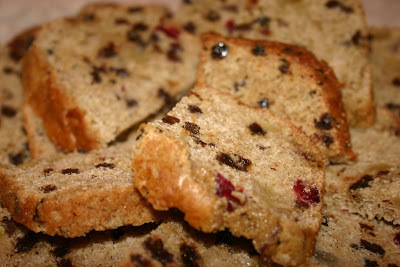 For the fruit, I used a mix of mostly pineapple and currants with a few cranberries tossed in for good measure. Pretty, no? Another trick I've learned is that if you let the finished loaf cool a bit, then wrap it in wax paper and place in the freezer overnight, it will slice beautifully the next morning. 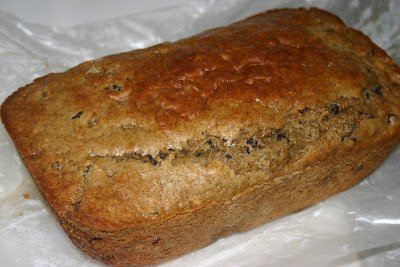 At the conclusion of my busy Saturday I returned home (where I still had some of all this stuff left over), and the Jeweled Earl Grey Tea Bread was still incredibly moist, even though I'd left the house in a hurry and left this on the counter uncovered. Yum-o! Preheat oven to 350 degrees and butter a 9-inch glass loaf pan. 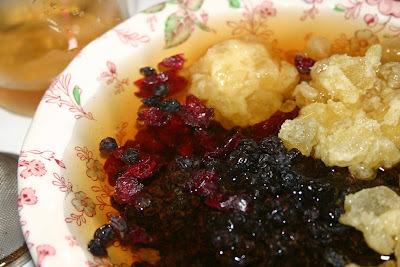 In a small bowl, soak the fruit in the tea for 30 minutes. Meanwhile, in a large bowl, combine dry ingredients and mix well. In another small bowl, whisk egg and milk. Make a well in the dry ingredients and add all the remaining ingredients (fruit and tea mixture, and egg mixture). Mix just until combined. 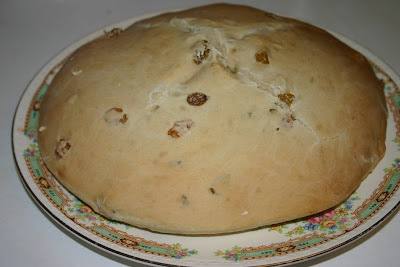 Pour batter into loaf pan and cook 50-60 minutes or until a knife inserted in the center of the loaf comes out clean. Let cool, then freeze overnight for easy cutting. 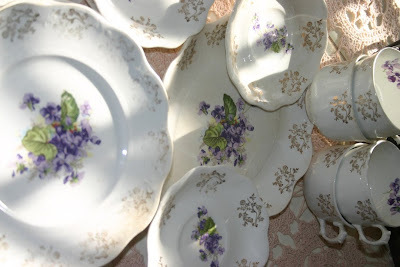 As soon as I walked into the Carriage House in Senoia, Ga. on Friday, my eye was drawn to this sweet set of violet dishes, artfully displayed in a vintage suitcase and simply begging to be the star attraction of some future tea party. Isn't the Carriage House pretty? It's one of the first antique shops I "bonded" with when I moved here to Coweta County after college. For those readers who don't live locally, the Carriage House is in Senoia, a town not far from the county seat of Newnan, where I live. If you are from here, or just want to act like you are, you pronounce it "Suh-noy," to rhyme with "boy." If you're not from here, you pronounce it "Suh-noy-uh." 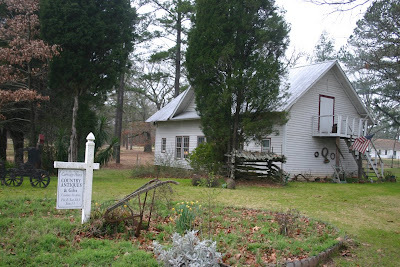 Named in honor of an Indian princess, the town has a delightful and rich history, which history-loving Nancy Roy of the Carriage House will be happy to share with you, I'm sure! 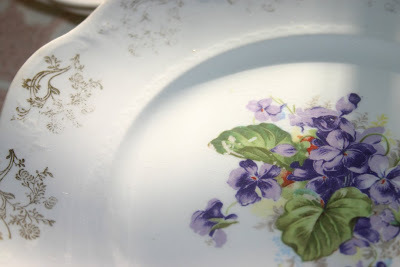 My biggest bag held this set of violet dishes, and I am really smitten with violets anyway. In my desk at work, I have some violet-flavored mints, and they are yummy. In the language of flowers, violets indicate watchfulness, faithfulness, modesty and humility, I'm told, all of them character qualities I could stand to improve upon. Never underestimate the power of a pretty shopping bag! Nancy carefully wrapped all my pieces in that nice, thick, spongey wrapping stuff, but then she bagged them in these sacks imprinted with a design of old newsprint. 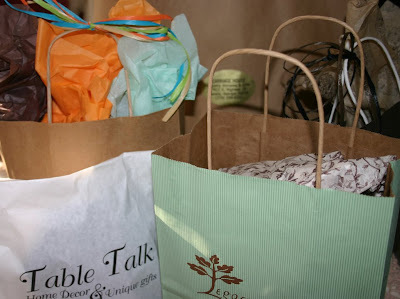 Now don't you know an old newspaper gal just LOVES getting something tucked inside these bags? 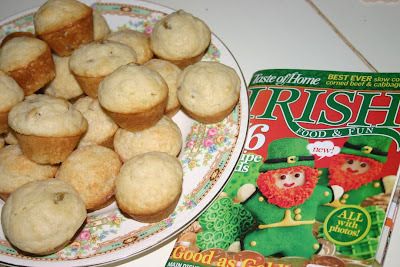 Born of a McDaniel and married to a McRae, naturally I am quite into celebrating St. Patrick's Day today! 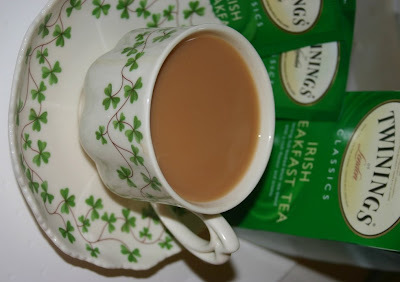 And it probably goes without saying that we began this day with some Irish Breakfast Tea from Twinings, with a little milk added. Today's teacup choice is this shamrock design teacup and saucer I found at a T.J. Maxx at the first of the year. Ideally, I'd really like to have teawares for every major holiday, so this is a good start. Back in January, I wrote about discovering the book "The Ultimate Tea Diet" whose author, Mark Ukra, runs the Tea Garden and Herbal Emporium in West Hollywood. 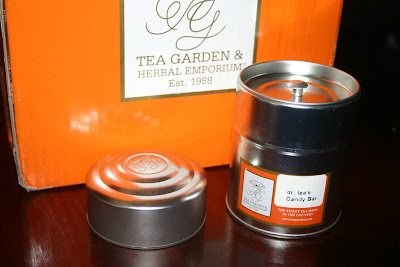 His book mentioned his Candy Bar Tea blend, with real chocolate right in the mix, and I said I'd like to try it but found it a bit pricey - $12.50 for a small 2.5 ounce tin, plus $6.50 for shipping. 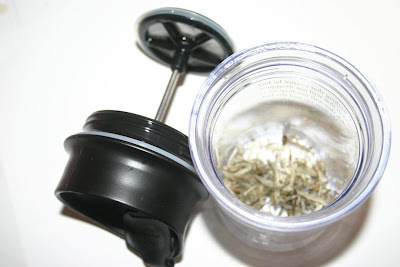 When Teresa asked yesterday about how to use a tea press, it occurred to me this might be a nice little topic to have on the blog for those of you who have never used one of these gadgets before. 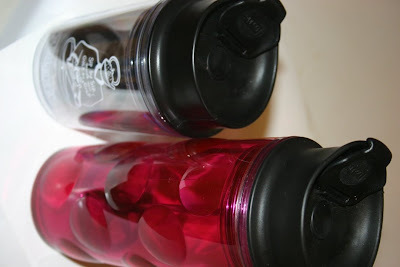 Here on the left is the new Citizen's Travel Press I received as a gift, and at right is the larger size tea press I've normally used, my latest being a hot pink Bodum model. 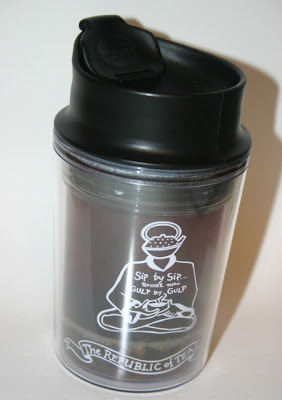 I have to say, though, I had the small one in my car's cup holder on the way to the office this morning, and I love-love-love using it. Here's what the small one looks like when the plunger top is off the cup. Note the fine mesh screen. (Don't I sound like a hostess on some shopping channel? 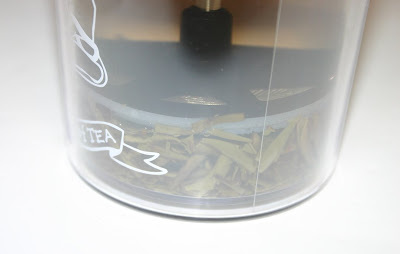 "Note the fine mesh screen, and if you order within the next hour ...") The mesh is what will press those tea leaves down in the tumbler while allowing your steeped tea to slip quietly on through. 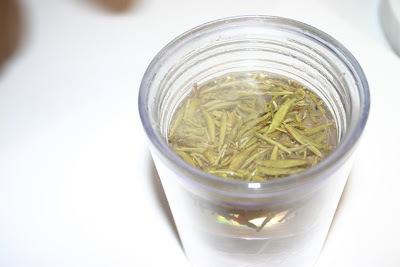 Next, a spoonful of Silver Needle Tea awaits the water. Five minutes later, and it's time to press the magic plunger. Look closely and you'll see the tea leaves pressed by the tea press. 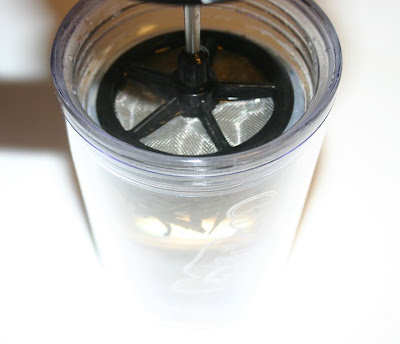 Another cool thing about one of these gadgets is that with many of the teas I've tried, you can remove the plunger, add more water and get a second steeping. 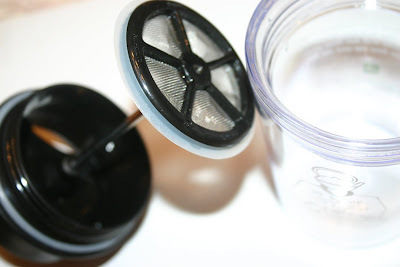 So if you haven't tried using a tea press before, this is definitely something you will want to check out! A few weeks ago, my friend Deberah came into the office with the neatest tea gadget I've seen in a while, a Citizen's Travel Press from Republic of Tea. It was just like the Bodum travel presses many of us use for steeping tea on the go (and this one is by Bodum as well), but it was small, just big enough for a single six-ounce cup of tea. Did you read the front of it? "Sip by sip rather than gulp by gulp." Gotta love it. Where'd she get it? I wanted to know. Whole Foods, it so happens, was the source. But of course! She is a frequent Whole Foods shopper, and I would be if I were near one more often. The first time I visited one several years ago, I was just overwhelmed by the fresh fruits and veggies, the biggest shrimp I've ever seen in my life, and a tea selection that was just incredible. It was a while, though, before I would fully "get" the Whole Foods concept. I was in Atlanta one afternoon last fall and developed a headache but had a few hours to go before an event in the city that night. I thought I'd pop into Whole Foods for a bottle of Advil. When I couldn't find any, I searched out a sales clerk and politely said, "Excuse me, where is the Advil?" 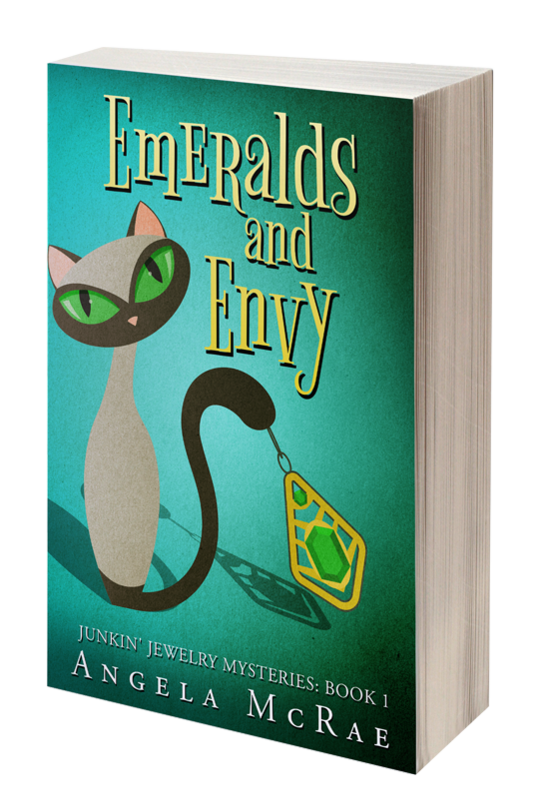 She rose to her full seven-foot height, adjusted her eyeglasses so she could glare at me over them, and said, "We don't SELL that," perhaps just the teensiest bit haughtily. It was as if I'd asked her to please direct me to the crack aisle. Instead, she showed me to the shelves where they had some $10 Advil-substitute. I thanked her, opted for a fruit tart from the bakery instead, and made it through the evening just fine. But I digress! My point is, my friend was back at Whole Foods recently and surprised me with one of these great little travel presses of my own! After she gave it to me, I confessed I've been visiting the Republic of Tea web site and STILL haven't seen this item listed, so I'm extra grateful for the thoughtful gift. 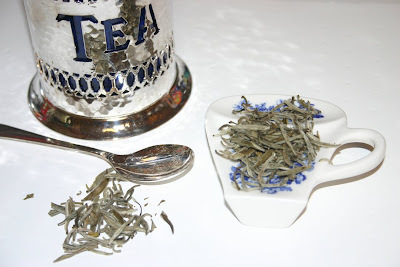 As soon as I started reading "The Silver Needle Murder" by Laura Childs, which I finished last week, I got a bee in my bonnet to go try some Silver Needle Tea. 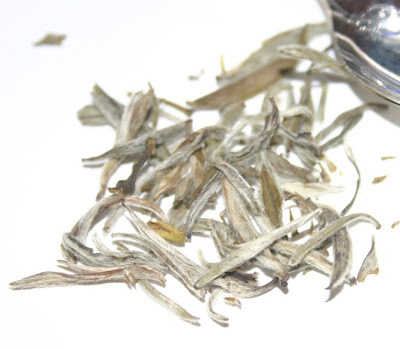 Here's how the book described it: "Silver needle was a white tea from China's Fujian Province. Picked in early spring, its dried leaves resembled white pine needles. 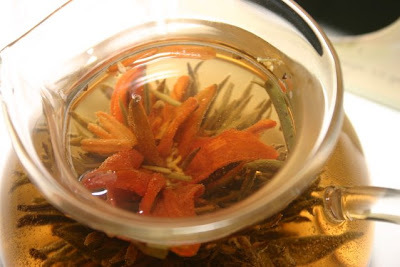 Brewing yielded a pale yellow tea with a delicious buttery almond flavor." Yum! So off I went to Teafusions, a tea shop in Peachtree City that is about 10 minutes from my house. The Silver Needle was rather expensive, I thought, at $9 for one ounce. 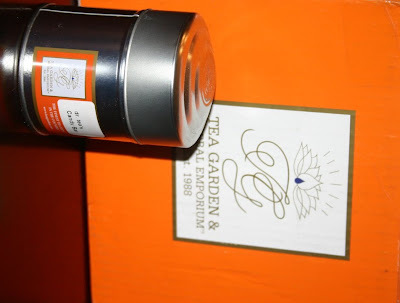 The tea was very fluffy, however, so the bag that I usually get with two ounces of other teas was nearly full. Once home, I transferred the tea to the vintage tea caddy I found recently, and I couldn't wait to try this "buttery almond flavor" tea.